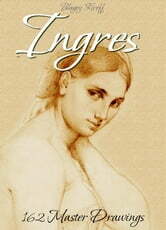 Ingres's style was formed early in life and changed comparatively little. His earliest drawings, such as the Portrait of a Man (1797) already show a suavity of outline and an extraordinary control of the parallel hatchings which model the forms. His portrait drawings, of which about 450 are extant, are today among his most admired works. While a disproportionate number of them date from his difficult early years in Italy, he continued to produce portrait drawings of his friends until the end of his life. Ingres drew his portrait drawings on wove paper, which provided a smooth surface very different from the ribbed surface of laid paper, which is, nevertheless, sometimes referred to today as "Ingres paper". Drawings made in preparation for paintings, are more varied in size and treatment than are the portrait drawings. He also drew a number of landscape views while in Rome but, with the exception of the small tondo Raphael's Casino, he painted no pure landscapes. Glimpses of the French Illustrators, Illustrated.